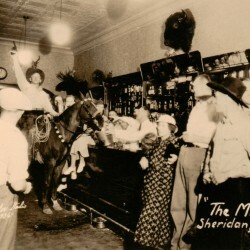 Upon Prohibition’s repeal in 1933, the Mint Bar reopened and was under the new ownership of Archie Wilson and his partner, Robert J. Thirwell. Their liquor license was obtained on March 30, 1935. An addition was built on the back of the building to make room for slot machines, roulette wheels and gaming tables, accommodating the thriving gambling clientele in the back room and newly legal drinkers in the front.